It was a cool, grey June morning, but the sea was calm as we launched Tusker into Whangaroa Harbour and slowly motored out looking for mackerel schools. Well short of the entrance we found them, filling the live-bait tank with 20 large jacks and putting around 40 on ice. Back to the ramp, boat out, and after a short drive we relaunched off a sandy beach as the weak sun struggled to push through low clouds. The breeze was starting to puff, but it was swinging offshore, and as we cleared the headland beneath the cliffs the sea was flat. With my brother Nick at the helm, and workmate and friend Jannik seated beside me, we settled in for the ride, hugging the coast. It was a day we had set aside for prospecting new waters, chasing winter kings with live-baits and hoping to ‘strike gold’. Many years ago, we realised the advantages of extending our fishing horizons, not only catching more and bigger fish, but elevating excitement levels and achieving a sense of adventure that comes from casting lines into ‘virgin’ water and not knowing what to expect. Exploring and fishing are now part of almost every Fulton-family fishing trip. But this doesn’t mean disappearing over the horizon at every opportunity – we still find hidden fishing gems in the stretch of coastline I look at every day from home. Live-baiting for kingfish is relatively new to us. 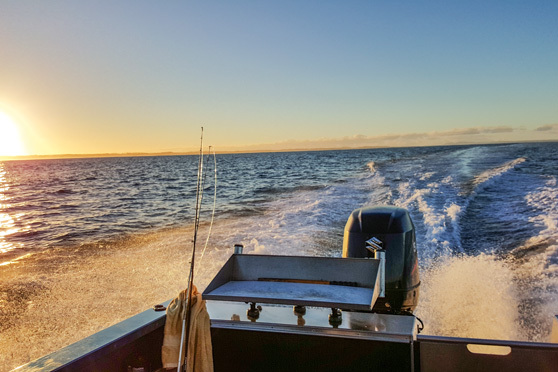 A few trips with Nick out of the Bay of Islands demonstrated its effectiveness, and saw Shine and me stocking up with ‘livies’ and pointing the boat in different directions at every opportunity to harass as many unsuspecting kingfish as possible through late summer and autumn. The technique Nick passed on to us involves a small, strong recurved hook, which is important, as we try to release around 90% of the kingfish we catch. The method relies on presenting the bait as freely as possible – the more active the mackerel, the quicker it gets eaten! Leaving the beach well behind, we skimmed along in steadily improving conditions, conversation lulled by the rhythmic noise of the engine and hull cutting through the ocean. Slightly off the side of a big expanse of foul, we slowed the boat and began quietly motoring over a small reef system in 12-22 metres of water. We saw some snapper sign hanging quite tight to rocks in a large area of sand. But the fiery-orange balls of bait that had been present the weekend before were gone, and after mucking around for no real result, we continued our journey. 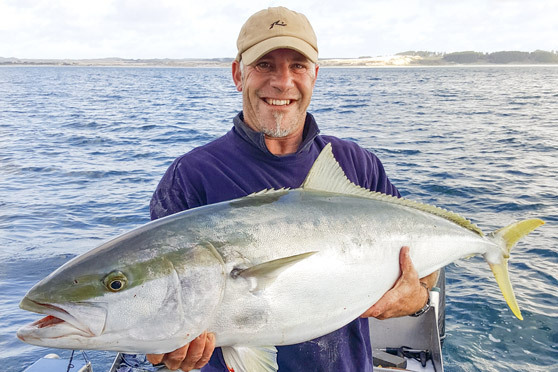 By the time we reached our next port of call, two gleaming Daiwa Catalina reels loaded with multi-coloured braid and wind-on fluorocarbon leaders were locked and loaded, modest-sized recurved hooks attached to energetic mackerel baits. Slowing down to a crawl, we began the familiar systematic search pattern, and this time we weren’t disappointed. Tightly packed balls of red-orange bait showed to one side of a small rocky pin, hanging just off the edge of the sand. Chunky arches suggested something bigger, so with the first drift planned, a single bait was eased over the stern. By this time the southwest wind was howling, but being so close to shore, the fishing remained comfortable enough. The water was green but clear, and not yet winter-cold. However, the first drift, then the second, revealed not a skerrick of action, and slight frowns creased our brows as we lined up for a third shot. Kingfish can be fickle biters. Every species of fish possesses different habits and qualities that demands an adaptable mindset from anglers to successfully catch them. Snapper are wily and cunning, so grit and patience are required to master them. Targeting kingfish, in our limited experience, can sometimes be like feeding a pack of starving dogs, where every bait gets monstered and little finesse or skill is required to hook them. Then, at other times, every technique in our admittedly limited repertoire fails to draw a strike. Healthy live-baits remain untouched, drift after drift, even when the sounder suggests all the ingredients for good fishing are present. It was beginning to look like that was the case here, and as we lined up for a third drift, Nick decided to fish as well – we seldom fish two lines. Midway through the third drift the large jack mackerel attached to his line came to life, the frantic pulsing transmitting to the rod tip. Seconds later the bait was slammed and ripped off the hook. Just moments later Jannik’s rod, on the opposite side of the cockpit, gave a distinctive double nod before loading up under brutal drag. Boat in gear and running with the wind, we headed out to sea with Jannik jammed in the corner and holding on for all he was worth. Despite our best efforts, the fish made several strong runs, before settling into the rhythmic head nods, punctuated by rattling head-shakes, that big kingies are renowned for. Relying on the beautiful Japanese gear we had invested so much money in, and putting huge faith in a fully-laden rod, painstakingly-tied knots, fluorocarbon leaders and hooks, we chose not to slow down, even when the sounder told us we were hundreds of metres out over the sand. Instead, we planed the fish up using the constantly moving boat. 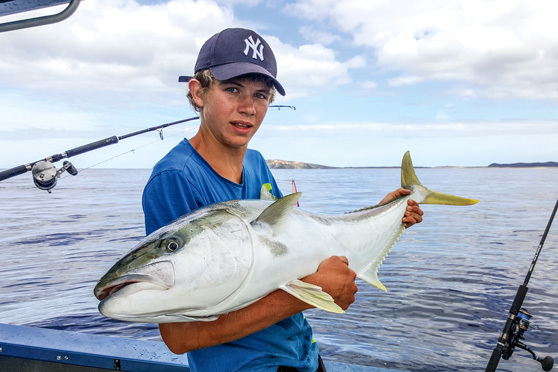 Only a few minutes after hook-up, we had colour – big colour – and with little drama Nick was able to secure Jannik’s kingie and heave it over the side. Although admittedly not ‘Three Kings’ big, we still estimated its weight at somewhere around 30kg, which is big for us and worth celebrating! Jannik couldn’t stop smiling and, being the first for the day and so fat, we killed it for the smoke-house. The beauty of fishing for kingfish is where there is one, there are usually more. As I motored into the strong southwesterly to find the school again, Nick pinned a frantically wriggling livie to his hook and prepared for action. Repeating the drift, Nick hooked up immediately, and within minutes had a very tired 18-kilo fish boat-side for release. A slight anti-climax after the previous fish, it set the tone for the afternoon, when more of these perfect silver-and-gold slabs were landed. We all had turns angling, and although the action wasn’t fast and furious, we each had our arms stretched several times. Jannik couldn’t stop grinning; he was a willing starter every time a rod was thrust into his hands and a live bait tossed over the side. On the verge of departing New Zealand for his home country, Germany, kingfish provided him with the perfect send-off. Prospecting for kingies has proven to be a lot of fun, with the enjoyment factor right up there. And because the gear and techniques are so refined, it has opened a whole new world of fishing pleasure. 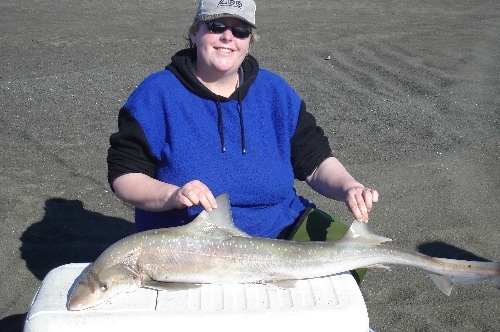 Like any form of hunting – on land or sea – the harder you look, the more you will find: it never ceases to amaze us that some quite unremarkable looking pieces of ocean can turn on such spectacular fishing at times.